Whether you are new to working out, need help operating the machines, are recovering from an injury, or are aiming for a perfectly sculpted body, our specially trained fitness coaches guide you on your path toward a life of total health and fitness. When you join Opti-Life, your personal fitness coach helps you create a comprehensive plan to reach your goals for total health and well-being. You then have access to a full suite of coaching packages so you can track your progress. Think how motivated you will be when you see strong, defined muscles and feel transformed into a renewed, healthier, more confident you. Shannon graduated from Longwood University in Southern Virginia with a degree in Kinesiology and a focus in Exercise Science. She is a certified Exercise Physiologist and Pre and Post Natal Fitness Specialist. She has 7 years of experience training clients, with many success stories. Shannon has personal experience and knowledge with pre and post natal exercise (including pelvic floor strengthening and diastasis recti (abdominal separation) rehabilitation. She also specializes in high intensity interval training (H.I.T.T) for body fat loss and is well versed in weight lifting for muscle building and toning. In addition, she has a large repertoire working with the older, active adult population. She has a lot of experience helping seniors regain range of motion and movement ease through appropriate exercises. Shannon was born and raised in Northern Virginia. She moved to Wichita in 2014, where she met her husband, Paul, a Security Forces SSGT in the Air Force. In 2015, she delivered their first child while he was deployed on his third tour overseas. In addition to their son, they also have a baby girl who was born in June 2018. Her family has two very spoiled rescue dogs, a three year old Lab and a one year old Sheepadoodle. Shannon’s ultimate dream is to someday complete a surrogacy pregnancy for a family. Four years ago I made a decision to better myself & to live a healthier lifestyle. Although I had to work for it, I am now proud to say I am in the best shape of my life and find joy in helping people achieve optimal health and well-being. I have 12 years of experience as a massage therapist, and more recently have attained certification as a personal trainer. My passion is to help my clients achieve their best lifestyle while learning about their body. I strive to help teach people about their own body, help heal chronic muscle issues and imbalances while helping individuals transform, grow and become the person they've always wanted. My massage modalities include deep tissue, neuro-muscular and trigger points. In my spare time I enjoy fly fishing for trout when I can - having learned that growing up in Salida, CO. I play lacrosse & ice hockey and am happily married to the love of my life, with our 3 cats & 2 dogs! A former collegiate athlete, played baseball at Hutchinson Community College and the University of North Carolina at Charlotte. I am an avid outdoorsman, whether its hiking or hunting I just love to be outside enjoying what nature has to offer. I have a passion for health and fitness, and believe that in order to live the best life that you possibly can, you have to fuel and treat your body in the correct manner. I love helping people reach their fitness goals, whether it be losing a little bit of weight, putting 20 lbs on their squat max, or getting ready for an upcoming sporting season. I enjoy meeting new people, making new friends and new memories. My favorite food is a medium rare filet, but a big juicy burger is close behind in 2nd! My favorite quote is “Don’t worry about the things you can’t control. Our focus and energy needs to be on the things we can control. Attitude, effort, focus - these are the things we can control." With a background in high school sports like football, baseball, and track and 4 years in the US Marine Corps, physical fitness has always been a part of his life. Those positive experiences led him to becoming certified as both a personal trainer and certified strength and conditioning specialist and completing his master’s degree in Exercise Science from Wichita State University. 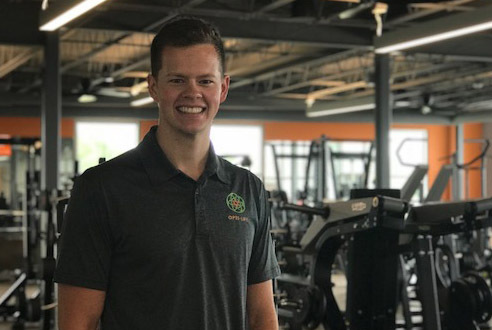 After a couple of internships and working a few years as a personal trainer, Coach Strick opened a fitness studio and began an onsite corporate bootcamp program. Experience and continued exploration led him to discovering his passion in holistic health. Coach Strick plans to continue pursuing the best version of himself and wants to help others do the same. Kathy decided to pursue a career in health and fitness after a lifetime struggle with obesity. After losing more than 100 lbs. she decided to pursue a deeper education in weight training and nutrition to help others to transform and lead a healthier lifestyle. She currently holds certifications with NASM and Precision Nutrition and currently studying for her Corrective Exercise Specialization. She has 7 years experience working with a variety of clients. She especially likes working with those that need that extra boost of motivation and belief that they can do this! She loves helping people correct muscle imbalances and improving movement patterns as well as helping clients achieve fat loss goals. Kathy's family includes her husband David and their rescue pup, Wiley! They have lived in the Wichita area for 4 years. One of Kathy's biggest personal accomplishments is representing the US in the WBFF Transformation Makeover Division in London in 2017 after losing over 140 lbs! Dave is a Master Trainer (ACE) with lots of experience... he has been in the fitness industry, at different levels, for 50 years. He has both an undergraduate and graduate degree in Health and Physical Education from the University of South Carolina, a specialized certification from the University of Florida. He has many years working in fitness centers in South Carolina and Maine, as well as being the owner/operator of his own private facility in Camden, Maine. He has performed over 30,000 training sessions with clients of all ages. Dave's main focus on fitness is to allow all clients to become stronger, therefore making it an easier task to perform activities of daily living. He believes that proper strength training requires some intensity and using a trainer/coach makes it easier to stay on task during moderate and intense training sessions. Dave feels that proper strength training works for all ages: adults, athletes, and seniors. Dave thinks that all movement and life experiences/activities keep us somewhat fit. See Dave for more information on transforming your life. Chelsea has been working in health and fitness since 2013 and is always looking to learn more in order to better help her clients. She graduated with her Masters in Exercise Science from Wichita State University in May of 2018 and is a certified Exercise Physiologist, Health Coach, and Group Exercise Instructor. She grew up in Colorado and has always enjoyed being active. Chelsea has a passion for helping people be the best version of themselves while participating in activities that they genuenly enjoy. Her specialties include corrective exercise, working with older adults, and body positivity. After struggling with obesity as a teenager and going through his own transformation, Matt decided to pursue a career in health and wellness. In high school he played basketball, soccer, and swam competitively. Matt graduated from K-State with a Bachelors in Kinesiology and is certified as an exercise physiologist specialized in making people feel young again through functional fitness. Matt enjoys training the three foundational components of fitness and making sure there is a balance between strength, endurance, and mobility. He believes exercise should be fun and does his absolute best to make it that way for all of his clients while making sure they get great results. Matt's easy going, relational personality, yet motivated and caring, makes him a top choice trainer for health and wellness. Caleb recently graduated from California State University, Long Beach with a Masters in Kinesiology, and a focus in Sport and Exercise Psychology. During that time, he completed an independent study that gave him practical experience as an Exercise Mental Performance Coach for the senior members and coaches at the LifFit center on campus. He also published and presented a thesis study at the 2018 *NASPSPA conference that supports the notion that increased confidence in a proxy-agent (Personal or Group Trainer), and increased confidence in the ability to self-regulate (behaviors, thoughts, emotions), are both positively associated with long-term exercise adherence. The study also was the first to identify specific mental techniques that people of various ages and stage of change would be most interested in learning and would be of most value to them. Caleb has also been physically training individuals and groups for more than a year now, developing creative and effective workout routines. Simply put, Caleb knows what it takes to get you to your goals, not just physically, but mentally as well! Caleb’s passion and teaching style revolve around taking you to the next level and increasing your confidence, by developing safe and effective workout routines with specific performance feedback. Caleb believes optimal life-satisfaction comes from proper life balance and working hard towards your personal values. “As a new father, I comprehend now more than ever how important it is to value health.” Whether the goal is to help you improve your balance and mobility, or to improve your strength and endurance, your goals are important! Being physically active on a regular basis should be an enjoyable part of your lifestyle and who you are! Caleb also loves sharing good music, art, good local food and crafts, and a beautiful scenery with his loved ones and friends! In her previous life, Dixie was a partner in a national CPA firm. There she motivated and pushed accountants to achieve results with clients to meet their financial goals. Her true love has always been physical fitness, helping people reach the goals they desire and beyond. Initially working to serve as a role model for her children in her 20’s, she has made exercise and fitness a priority ever since. Dixie is a motivator who makes sessions fun yet effective and encourages people to do their personal best. Dixie asks questions to understand each client’s achievement goals, and then together they create a realistic plan that makes the client look forward to their next workout session. One of her most rewarding accomplishments was working with a gentleman who, over the course of a year, lost 150 pounds by incorporating both diet and exercise. Dixie believes and instills the belief in her clients that you can accomplish just about anything you desire if you are willing to work for it. Dixie enjoys working with older individuals and anyone looking to improve their health, lose weight, tone up, and become stronger. Dixie is married to Bob, they enjoy working out together, obstacle courses, destination races, travel, and of course, their children and grandchildren. 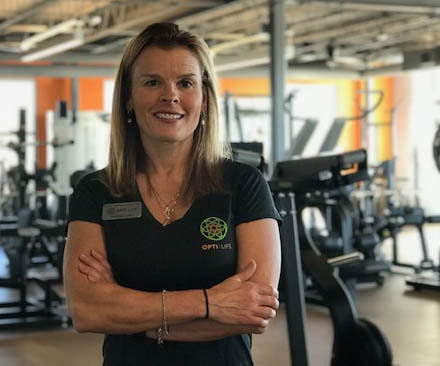 Dixie holds a Personal Trainer Certification from the American Council on Exercise and is currently working to obtain her certification from the American Council on Exercise in Sports Nutrition for Health professionals. She also graduated from Friends University with a degree in Business Management. A former collegiate athlete, Bri played basketball at Newman University and her background in athletics has driven her to pursue a career within health and wellness. She received her Masters of Education in Exercise Science from Wichita State University, where she conducted research for the Department of Human Performance Studies. This research sought to determine relationships between orofacial myological function, multiple modes of exercise, and various physiological factors. As a Certified Personal Trainer, she is well versed in multiple modes of exercise. She tailors to the needs and goals of her clients by working on various components; which may include building strength, improving cardiovascular endurance, increasing flexibility/range of motion, and correcting muscular imbalances. She is very passionate about educating and providing the tools necessary to help anyone achieve their goals and hopes to inspire people to be relentless in their pursuit of self-improvement! Valerie Juhl began her fitness career as a group fitness instructor in 1986 while she served 20 years in the United States Air Force. A year ago, she decided to fulfill her long time dream and accomplished her National Personal Training Certification through The American Council on Exercise (ACE). Having achieved that goal, she established fitness as her primary career affording her the opportunity to train and coach individuals as well as continue with conducting group exercise sessions. As a fitness coach At Opti-Life, Valerie says her goal is “to serve the needs and expectations of my clients to the best of my ability. And provide them motivation and challenging workouts to help them meet and surpass their fitness goals and ultimately enhance their quality of life.” Valerie’s coaching emphasis and focus is on strength and core training combined with cardio conditioning to help improve her clients’ energy level, strength and stamina as well as giving a boost to their metabolism and maintaining their balance, stability and mobility. Valerie has been married for 25 years and has a grown son and daughter as well as 2 dogs. Her hobbies include bicycling, boating, weight training, and country dancing. Nicole is a certified personal trainer, group exercise instructor and Registered Dietitian. She has a B.S. in Exercise Science from University of Memphis and a B.S. in Food and Nutrition from University of Alabama. She grew up competing in gymnastics, cheerleading, and track and went on to compete at the collegiate level in cheer. After graduation, she began running 5K’s, half marathons, and competing in various fitness endeavors. She also began training and teaching fitness classes and has been working with a variety of clients for over 10 years. She has a passion for functional fitness and helping people realize their full potential through health and fitness. She has a busy family with her husband and three young kids and understands balancing health with the demands of real life.